In May 1970, the Massachusetts Commissioner of Public Health warned 63 communities of excessive sodium in their water supplies. 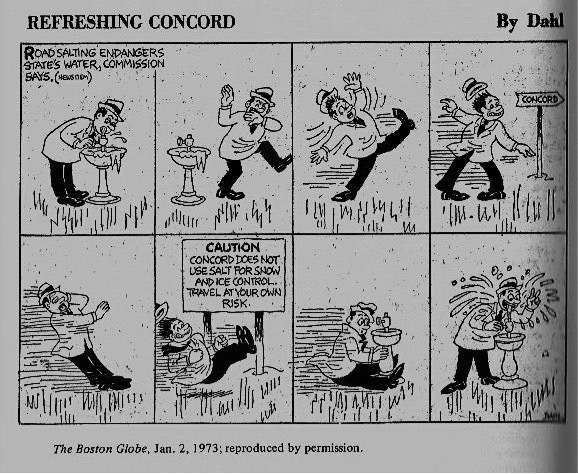 In June 1971, the Massachusetts legislature created a Special Commission to "study the danger of pollution of ground water supplies and destruction of the environment by the use of chlorides and other chemicals to remove ice from public ways." The Commission sought technical help from Arthur D. Little, Inc., which charged me with leading its team. One of the 63 towns was the Boston suburb of Burlington. Rain and snow leached de-icing salt, piled high but uncovered next to the town well which tapped its aquifer. This raised the water's chloride level far above the standard 20 milligrams/liter, thus endangering pregnant women and citizens fighting congestive heart failure, hypertension, and cirrhosis. 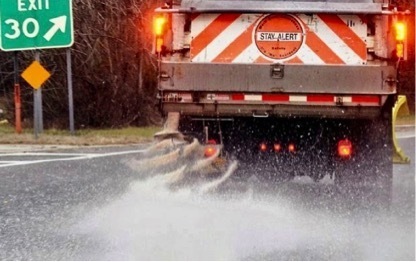 So Burlington banned salting and switched to sanding winter roads. 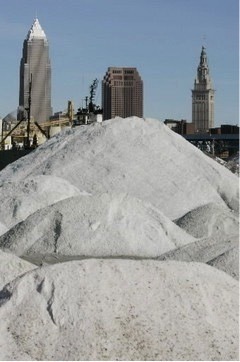 But spring cleanup of sand was cumbersome and costly. Another town was the suburb of Weston, through which runs the Massachusetts Turnpike. Rising chloride levels forced Weston to close two of its three wells. 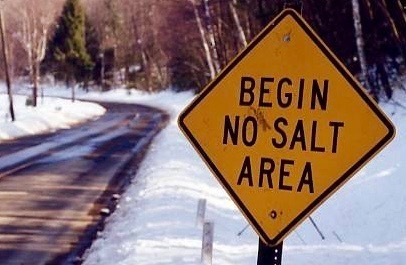 An alarmed school teacher educated herself about environmental side effects of over-salting and sparked others to form Citizens Committee Against Road Salt; they campaigned in the press, debated highway officials and salt industry lobbyists, and petitioned the legislature. I spent snowy nights in several states riding de-icing trucks with highway plowmen to learn their work and problems. In inland and rural areas where winter temperatures typically fall and stay well below freezing, keeping roads drivable is relatively easy. More difficult by far is coastal areas where temperatures fluctuate maddeningly above and below 32 degrees Fahrenheit. Adding to their pressures in congested communities are busy commuters whom they had encouraged to expect the luxury of bare pavement "June travel in January." We analyzed the arguments of all parties in the debate. We synthesized data from chemistry, sanitary engineering, road maintenance, and public health to develop public policy for a problem where behavior, as well as technology, are important. One technical issue, storing salt in uncovered piles, could be corrected by building sheds with proper covers and drainage. Another problem, haphazard over-spreading, needed careful metering. A third task, reducing salt drainage into water sources, needed signs on roads crossing drainage basins warning of no, or reduced, salt. The difficult behavioral challenge was educating the public to expect and adapt to riskier road conditions in winter. Both highway workers and the driving public should downplay the attractive but unnatural goal of bare pavements year-round. We recommended local community education programs, helped by this cartoon. We also recommended state-wide legislation. I tracked and reported the bill's legislative struggles. 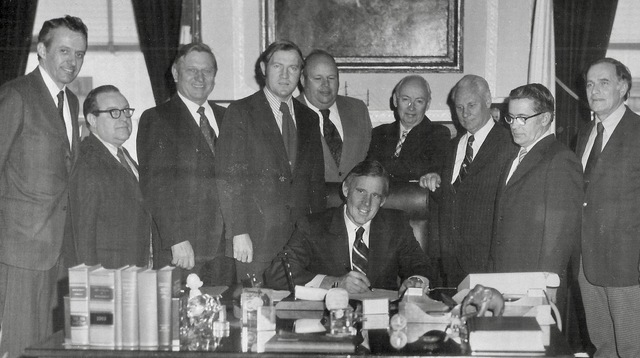 When Massachusetts Governor Francis Sargent signed the bill as an emergency law in December 1973, I was invited to attend (standing far left). Later, for the Federal Highway Administration, my Arthur D. Little team wrote the two-volume guide for state and local highway departments. 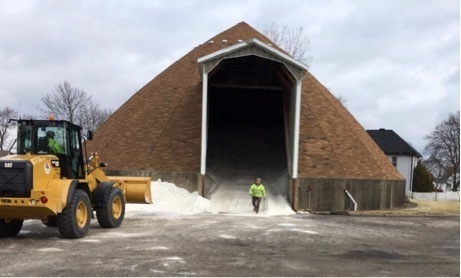 Today, many highway maintenance yards include properly-designed salt storage sheds, and departments are following our recommendations. 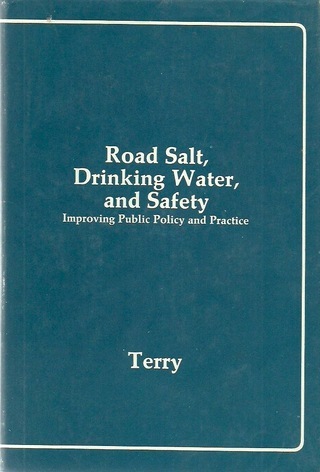 I was then invited to report our work in my 1974 book, Road Salt, Drinking Water, and Safety: Improving Public Policy and Practice. ". . . extremely well-written and comprehensive . . . I hope . . . its recommendations become a standard guide for action." " . . . very readable . . . excellent portrayal of our political system responding to a serious, identifiable problem." ". . . well written . . . added a new dimension, that of Public Health, which highway-oriented people heretofore have been prone to overlook." " . . . exceedingly competent . . . performed an extraordinary service . . . "
" . . . such an excellent, complete, documented report . . ."
" . . . extremely comprehensive . . . by far the best treatment . . . that I have seen . . . "
To order my book online, click here. Also available in some libraries.